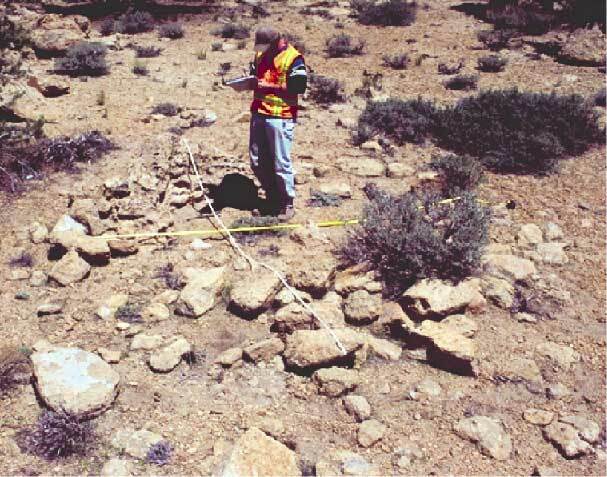 Archaeologists working for the California Department of Transportation (Caltrans) along Highway 395 in the eastern Sierra Nevada have discovered many rock rings and small areas of burned earth in the pinyon forests. Excavations and microscopic analysis of plant remains from these features indicate that they are the remains of hearths or pit ovens used for roasting pinyon cones to extract the nuts. Pinyon nuts have long been an important food resource for Native Americans, and the pinyon forests along the eastern slope of the southern Sierra Nevada have been harvested for thousands of years. Remains of a Hearth or Pit Oven.